We’re already expected HTC to lift the curtain on its flagship M7 Android smartphone on Feb. 19, but apparently the company has a couple of other smartphones on the way, too. UnwiredView said it has learned of two devices, the M4 and the G2, that might be unveiled on the same day as the M7 or during the Mobile World Congress trade show in Barcelona later this month. The M4 allegedly packs a dual-core Qualcomm Snapdragon processor clocked at 1.2GHz, 2GB of RAM, a 4.3-inch screen, 16GB of storage, a 13-megapixel camera, a 1.6-megapixel front-facing camera, Android Jelly Bean and a 1,700mAh battery. Meanwhile, the G2 is more of an entry-level device. It’s equipped with a 1GHz processor, a 3.5-inch display, 512MB of RAM, a 5-megapixel camera, 4GB of storage, Android Ice Cream Sandwich and a 1,400mAh battery. 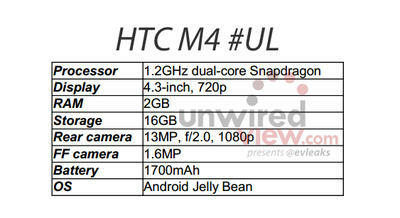 We’re not sure why HTC would launch a U.S. phone with ICS at this point, so we’re guessing this is destined for emerging markets. Here’s the catch: HTC already launched a phone called the G2 in the United States (on T-Mobile), so it will probably launch under a different name if it does actually hit our shores. We’ll be attending HTC’s press event on Feb. 19, so stay tuned for the full story.